Beans 'n Taters - Taters 'n Beans: Turkey Pot, Turkey Pot, Turkey Pot Pie! 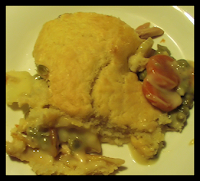 Hubby loves pot pies, but they aren't my cup of tea. The neighbor grocery store has homemade chicken pot pies that I get for a treat for him, then I don't have to eat them. lol Works out well. Yummo! Great idea for leftover turkey! It's always great to stumble on these food blogs. I do a lot of cooking and am starting to get loads of decent recipes from blogs. This looks really good. This looks absolutely mouth watering delicious!